Heroin addiction is an epidemic in our country. Many people who are already addicted to prescription opiate painkillers are now turning to heroin, due to availability as well as a reduction in cost. Heroin is illegal and highly addictive. Derived like all opiates from the poppy plant, heroin is usually found in powder form. Heroin users either snort, smoke, or, most dangerously, inject the drug. Intravenous methods are the quickest route to the intense euphoria and relaxation that heroin provides. 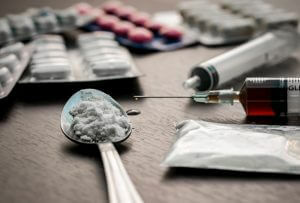 His House men’s heroin treatment plans recognize the medical risk involved with heroin addiction, including diseases such as hepatitis and HIV which are passed through shared needles. We have listed common reasons why heroin is abused. Many heroin addicts equate the withdrawal period from heroin similar to a severe case the flu. The withdrawal itself is what keeps many users hooked on heroin. Heroin addicts end up continually “drug seeking” in order to avoid the harsh reality of withdrawal. Heroin use is serious and deadly. If you have an addiction to heroin, we want to help you! A majority of heroin addicts risk overdose every day. Heroin addiction is a killer lurking among our society. Heroin addiction does not discriminate; it can happen to anyone. Heroin treatment is available at our men’s rehab center. We can help you with heroin detoxification and withdrawal treatment as the starting point for getting clean. Our experienced staff will ensure that you are as comfortable as humanly possible during withdrawal. Our heroin rehab is a full service facility that aims to address all the aspects of the disease of addiction. Addiction is a disease of the mind, body, and spirit. Our heroin rehab center understands the importance of healing each of these components. We have a full staff of medical professionals, addiction specialists, mental health professionals, and other healthcare providers on hand to guide you through our heroin treatment program. Rehab for heroin is essential in beating this grave addiction. Heroin addiction rehab can show you the tools to incorporate into your life to live a life free from the chains of addiction. Overcoming heroin addiction may seem like climbing Mount Everest. You do not have to face climbing this mountain alone. The single bravest act a heroin addict can do is to make the decision to get help. The courage to take that first step on the path upward can be found with help from His House. You deserve a chance for recovery from heroin addiction. Our goal is your sobriety, so call today to get started!